The Rock Saves The Day. Snitch, Reviewed. 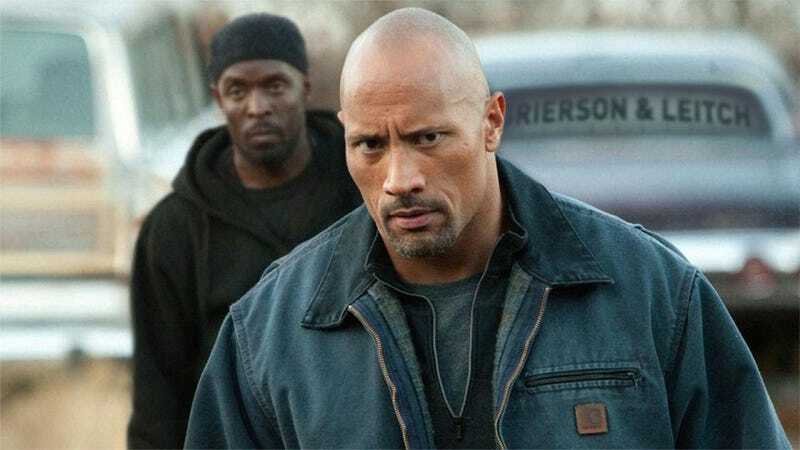 Snitch isn't great, but if you're like me and have enjoyed Dwayne Johnson more than his movies, his latest helps justify our faith in the guy. This is a B-movie thriller built around a real incident that's meant to show us the lunacy of our government's drug policy—and yet the movie's not preachy or sanctimonious. Unlike a lot of gritty action movies, it's got a brain and some real feelings to boot. And even as Snitch gets progressively more ludicrous, Johnson is so empathetic that you basically accept the nonsense around him because he makes you want to root for this movie to be good. After suffering through so many duds with Johnson, it's nice to see him in something respectable. The movie stars Johnson as John Matthews, a regular guy who owns his own construction company. He's doing pretty well for himself and his new wife and daughter, but he gets a call from his ex-wife that their son Jason (Rafi Gavron) has been arrested by the Feds for accepting a delivery from one of his buddies that contained ecstasy. Because of the U.S.'s mandatory-minimum laws, Jason will automatically receive a 10-year jail sentence, even though the kid isn't involved with drugs or dealing. Hoping to get leniency for his son, John visits a U.S. Attorney (Susan Sarandon), who will grant Jason a lighter sentence if John can help the government bust other drug dealers. If you've seen the fine war on drugs documentary The House I Live In from last year, Snitch's premise won't seem implausible. The movie underlines the madness of a policy that levies huge penalties against anyone involved in drugs (even if they're only tangentially connected) in the hopes that they'll be desperate enough to assist the feds in rounding up other dealers. Of course, director and co-writer Ric Roman Waugh, a former stuntman, takes that premise and goes his own way with it, but nonetheless there remains in the film a compassionate and angry sense of how deeply unfair American society is—whether we're talking its drug policy or class system. Likewise, Daniel is more than some former felon: He's a guy who legitimately wants to turn his life around to support his own family, although with Daniel's criminal past, it's just about impossible for him to find a decent job. Without ever piling on the pathos, Bernthal makes you worry for Daniel, who doesn't realize that John is happily sacrificing his employee's future—a third strike would be life in prison—just so he can get his own son out early. It's a really strong performance in a movie that features a bunch of names—Susan Sarandon, Barry Pepper, Benjamin Bratt—who could have easily just phoned it in for their paychecks. Impressively, nobody does. The dialogue tends toward tough-guy speak, but there's a stripped-down simplicity to the whole film that elevates everything a notch or two above what it normally is for a movie like this. Eventually, Snitch becomes the action flick you assumed it would be, full of car chases and shootouts. But even then, Waugh stays mindful of the human element, reminding us of all the real lives ruined either by drugs or by a U.S. policy that overreacts to the problem. Really, it all comes back to Johnson, who's quietly persuasive and compelling from the first moment. He's always going to look like a wrestler, and you'll never throw around Italian phrases to describe his performances. But bravura isn't what's required—he simply moves the film forward from scene to scene, putting a sympathetic face on a message movie that's smart enough to know it's not really a message movie. Snitch takes on the demeanor of its star: It's earnest, genuine, likeable, a bit of an underdog. This is the sort of threadbare thriller that doesn't have the wherewithal to be amazing but, happily, that didn't stop everybody involved from actually going to the trouble to try to make it good.